Remove the chorizo from any casing, as needed. In a large, nonstick pan, sauté the chorizo until cooked through, breaking up any big pieces with the back of a spoon. Remove the sausage to a separate plate. If necessary, drain all but 2 tablespoons of grease out of the pan. Return the pan to the burner and heat. Add the frozen spinach to the pan. Sauté, stirring occasionally, until the spinach has thawed, and all liquids have evaporated, about 5 minutes. Meanwhile, in a small bowl, whisk together the eggs, green onion, salt, and pepper to taste. Pour the egg mixture over cooked spinach and scramble together. Remove the eggs to a separate plate. Heat up a small nonstick skillet. Place one tortilla on the skillet. Cook 1 minute. Sprinkle half of the tortilla with cheese, top with sausage, egg, then sprinkle again with shredded cheese. Fold the empty half over the filling. 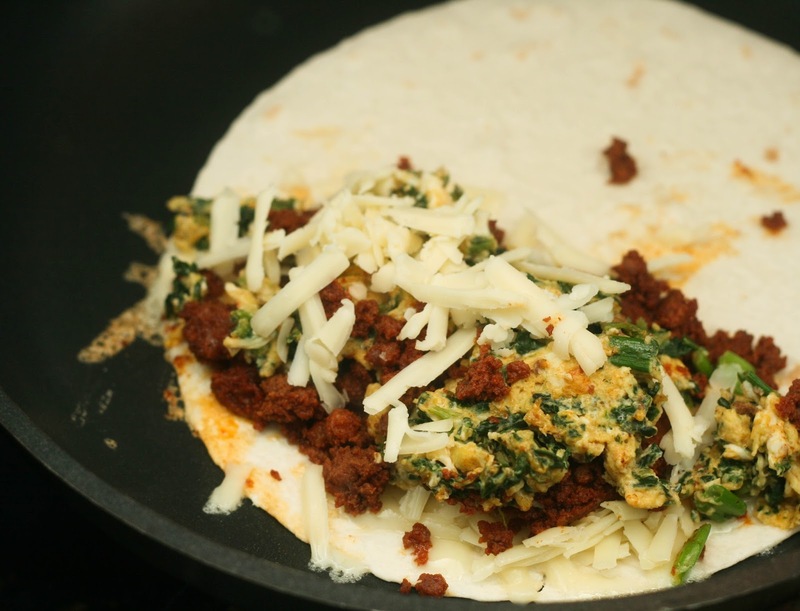 Cook, flipping once, until the tortilla is browned and the cheese is melted. Repeat for remaining tortillas. Serve immediately. Keep the quesadillas warm until ready to serve by placing them on a platter in a preheated, 200° oven. Every January I get a bunch of messages asking for tasty, more wholesome recipes to start off the New Year. After the winter holidays it seems like everyone is looking at food with new eyes. When Mission® got in touch about developing a recipe using their Carb Balance Flour Soft Taco Flour Tortillas, it sounded like a perfect fit! I hadn’t tried them before but why not? I am happy to say I was really pleased with the results. The Carb Balance Tortillas were as soft, thick, and flavorful as traditional tortillas, and are perfect for all kinds of meals and snacks. I even did a little taste test challenge and my husband couldn’t tell the difference between a quesadilla made with a traditional tortilla and the Carb Balance Tortillas—high praise from someone still obsessed with the breakfast tacos he ate nearly 20 years ago in Austin, TX. 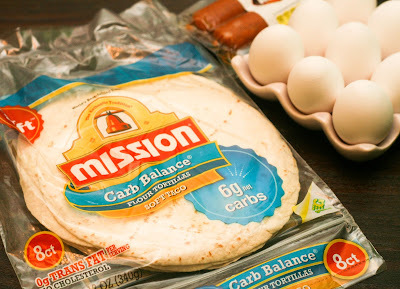 These tortillas contain only 6g of net carbs per serving, and are an excellent source of fiber making them a better choice for your breakfast. When I think breakfast and tortillas, tacos are the first thing that come to mind. Well, that and migas. I wanted to make something different. 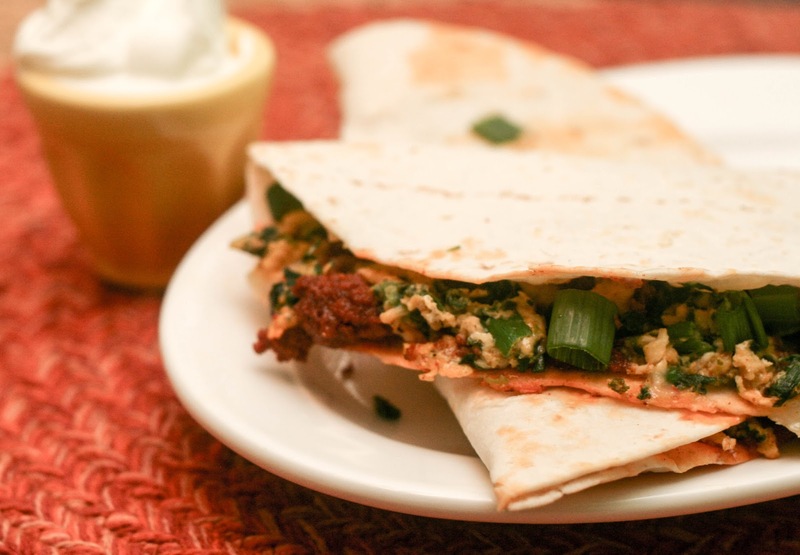 Enter the breakfast quesadilla. Just as easy as tacos but more cheesy. Who doesn’t love cheese? These are super easy too as they are made by folding the tortilla over in half rather than trying to layer them. 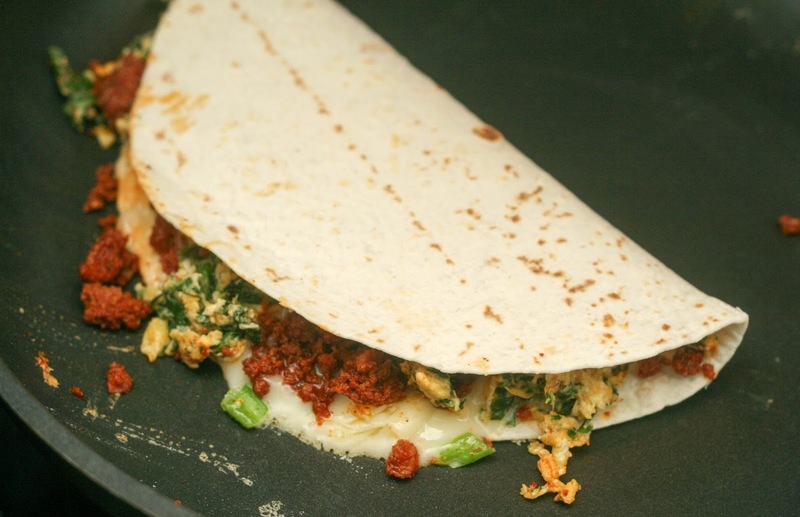 The spinach adds some veggies to the mix, the green onion adds some bright, fresh flavor, and the chorizo is the perfect spicy meat filling. A great, low-carb, protein-packed option. This recipe makes a great breakfast for friends and family or enjoy them on your own. Bonus? Store any leftover, finished quesadillas in the fridge and reheat them in a pan or microwave the next day for a no fuss breakfast. Warming them tastes the best so resist the urge to eat them cold! Mission is also hosting a contest for a chance to win a Fitbit® tracker! You can enter by going directly to www.MissionToChange.com or share your New Year’s inspiration and/or resolution on Twitter including the hashtags #MissionToChange and #Sweepstakes (must include both). Find out more at www.MissiontoChange.com!